Political analysts were quick to declare victory for Hillary Clinton after the Democratic nominee’s first debate with Donald Trump on Monday night, and a new Politico/Morning Consult poll shows roughly half of likely voters agree with that assessment. According to the survey of likely voters conducted immediately after the debate at Hofstra University, 49 percent of respondents said Clinton won the first bout with her GOP foe. About one-fourth (26 percent) thought the New York businessman edged the former secretary of State, and about the same percentage (25 percent) were undecided. Perceptions on debate performance mostly broke along partisan lines, but Republicans were more likely to declare Clinton the winner than Democrats were to state victory for her GOP counterpart. 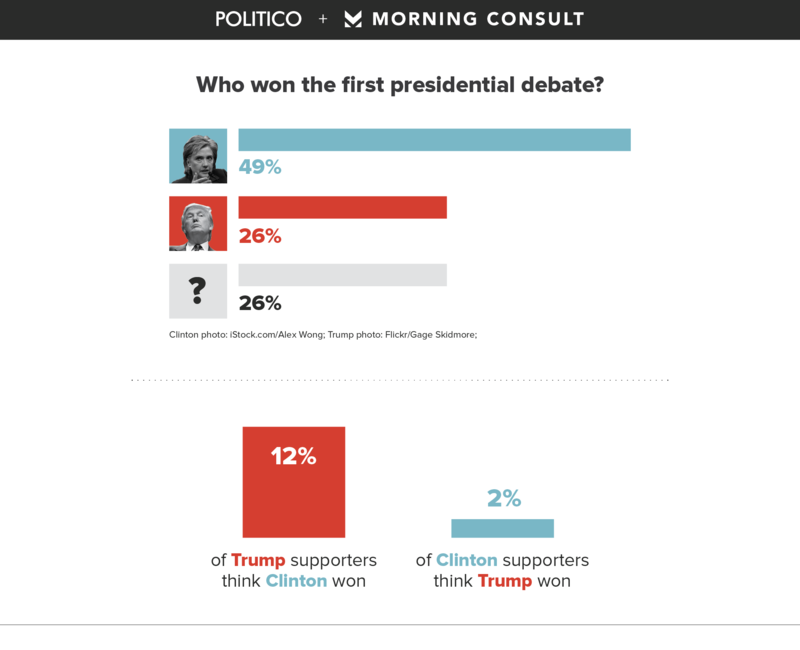 About one-fifth of Republicans (18 percent) said Clinton won the debate, compared with just 7 percent of Democrats who thought Trump was the victor. And 12 percent of Trump supporters gave Clinton the nod, whereas just 2 percent of Clinton backers named Trump the winner. It’s a clear victory for Clinton, and it comes as both national and state polls have tightened over the past several weeks. She is off to a good start on the debate front, which Americans view as important in deciding how they will cast their vote in November. One-third of voters (34 percent) said debate performance will be a very important in how they vote, while 29 percent said it would be somewhat important, compared with 34 percent of voters said it wouldn’t be too important or not important at all. But the impact of Monday’s debate is still small. 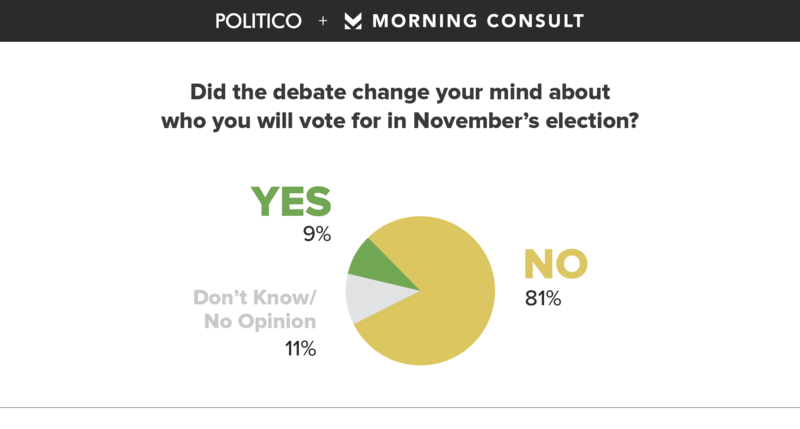 Just 9 percent of voters said the debate changed their minds about who they will be voting for, while about eight out of 10 said it wouldn’t matter. Before the debate, Trump led Clinton by 1 point in the four-way race with Libertarian Party nominee Gary Johnson and Green Party candidate Jill Stein. But Clinton now leads Trump by 3 points (41 percent to 38 percent), and in a head-to-head scenario, she leads by 4 points (45 percent to 41 percent). For two candidates who are historically unpopular, the debates represent some of their best, last chances to shape voters’ perceptions ahead of Election Day, and Trump did not fare comparatively well in that regard. Roughly four out of 10 voters (39 percent) said they viewed Clinton more favorably after the debate, compared with 30 percent for Trump. And while the candidates can help their cases during the debates, most voters are still dismayed at their major-party choices in 2016. More than half of voters think the Republican and Democratic parties could have nominated better candidates than Clinton and Trump. About one out of four respondents (26 percent) think Trump is the best choice for Republicans, compared with one-third who think Clinton is the best Democrat for the job. That goes some way to explaining the relatively high support for third-party candidates, who have been a factor in polls. Indeed, more than four in 10 voters thought Libertarian Party nominee Gary Johnson and Green Party nominee Jill Stein should have made the debate stage. Nielsen declared the much-hyped event the most-watched presidential debate of all time — at roughly 84 million viewers — and a large majority of our poll respondents tuned in. Seven out of 10 (72 percent) respondents said they watched the debate, while only 27 percent did not. More than half of voters who tuned in (55 percent) said they watched all of it, with another 44 percent saying they watched most or some of it. A plurality of voters (42 percent) thought that moderator Lester Holt — who pressed Trump repeatedly on his past stances on the Iraq War and President Obama’s birthplace — was fair and impartial. But more than one-fourth of respondents (27 percent) thought he was favorable to Clinton. Just 2 percent thought the NBC news anchor was more favorable to Trump. The prospect of live fact-checking during the debate was a subject of vigorous argument ahead of Monday’s event, and voters found Clinton to be more correct in her claims. Almost half of voters (48 percent) thought Trump made the most factual errors in the debate, compared with one-third who said Clinton did. The reception to the debate itself was generally positive. More than half of voters thought it was informative (55 percent) and entertaining (62 percent). Half of voters said it was something they would watch again, and more than one-third (37 percent) said it would help them make up their mind. But given that more than one-third of voters (36 percent) called it depressing, almost one-fifth (18 percent) said it was boring, and 30 percent described it as awful, it’s clear that there’s plenty of angst among the American electorate ahead of decision day. The national survey, fielded immediately after Monday’s debate ended, polled 1,421 registered voters and 1,253 likely voters, from Sept. 26-27 for a margin of error of plus or minus 3 percentage points. Debate survey: Likely voters: toplines and crosstabs. Registered voters: toplines and crosstabs. Trend survey: Likely voters: toplines and crosstabs. Registered voters: toplines and crosstabs.